Mainstreet Research (a firm not around for the 2014 Ontario election) is beginning a daily tracking poll today, so with three weeks to go in the campaign we should expect to see this and the results of many other surveys. There will be much said good and bad about individual polls in this campaign. However, one hard piece of information we do have is how the polling companies performed in 2014. After it was over I compared the polls conducted in the last week of the 2014 campaign with the results on election day. I calculated the difference between each party's share of the vote and the final public polls, then added them up to get the big picture. In addition to the above there was a Nanos poll published about two and a half weeks before election day that ended up being the most accurate. It was excluded from this analysis because of its timing. You will note with all the red that the polls then mostly underestimated Liberal support. That kind of pattern could easily emerge this time, but with some other party's support being understated. The most accurate poll from the last election could change this year and the shift could be significant. To take another example from federal politics, between the 2011 and 2015 federal elections Angus Reid went from most accurate to least. 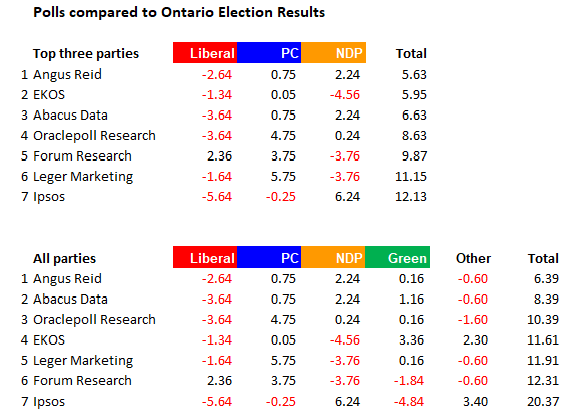 The 2014 polls were more or less accurate although you could not tell clearly from the closing polls that the Liberals were definitely headed for a majority. When it comes to policies and complex matters requiring good judgement, polls can make large errors. A recent Ipsos poll makes the argument that Ontarians prefer spending cuts (71%) to running deficits (17%) or raising taxes (12%) as budget policy. Piffle. For most voters the term "spending" is a difficult to understand abstraction. Substitute the words "less health care and education" for "spending" and see what you get.